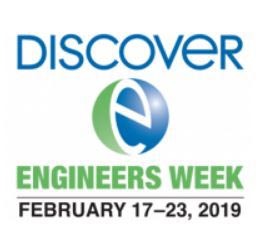 Join us as we celebrate National Engineers Week! February 16 - February 23, 2019. Engage in some everyday engineering, from Balls and Ramps to Indoor Fort Building, Straw Structures, SailMobiles and more! Check our website for the event of the day, www.discoveryacton.org. 11:00am to 2:00pm each day. National Engineers Week is sponsored by Raytheon. Event included in admission, $14.50.